← JJHS Language Arts Teachers Alana Kooi & Deb VanDuinen Rise to the Top! After a harried morning of looking for shoes, fighting traffic and dodging flood zones, you turn the corner on Connie Street to drop your child off at Jenison’s Early Childhood Center. Walking through secure doors, you pass an impressive aquarium whose bright colors are matched only by charming displays of artwork dotting the halls. Making your way past the infant rooms, you locate your child’s preschool classroom and scoop her up for a last kiss before she skips into class. Stopping at the coffee kiosk for a free cup of flavored Joe on the way out, you nod to the chef who’s returning to the kitchen with an armful of veggies from the school’s garden. You realize that your bologna sandwich will pale in comparison to the lunch your four-year old will be eating, but you wouldn’t have it any other way. The scenario above is not part of a movie or a facility reserved for an elite crowd of Hollywood starlets. It is a snapshot of life at the ECC for every parent and every child who walk through the doors (*bologna sandwich optional). With room for little ones starting at 3 months and up to 5 year old pre-kindergarteners, this school is buzzing with laughter and finding innovative ways to make learning fun. Mr. Westervelt at the coffee kiosk. Principal Lee Westervelt beams like a proud parent as he weaves through the hallways. He knows this school is special, and notes that parents drive from as far away as Allegan County and Grand Haven to grab a coveted registration slot. 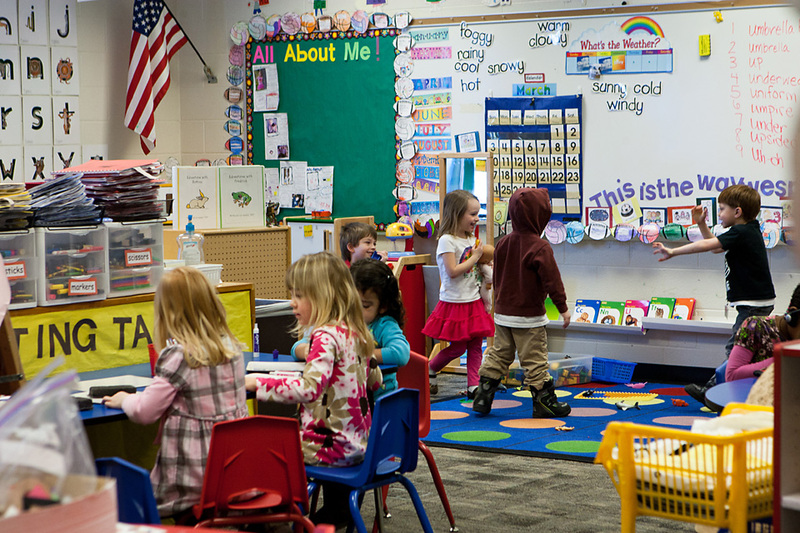 At the moment there is a waiting list for preschool at the ECC, despite incorporating the use of several portables and rooms at other Jenison Elementary Schools. Currently, 450 children are in the building every day, with another 300 in satellite locations. “We’ve been fortunate that there is a lot of stability here. We’ve proven that we hire people who have graduate-level preparedness and who stay. We really don’t experience a lot of turnover, which is great for the kids. I hire the best people out there,” said Mr. Westervelt. 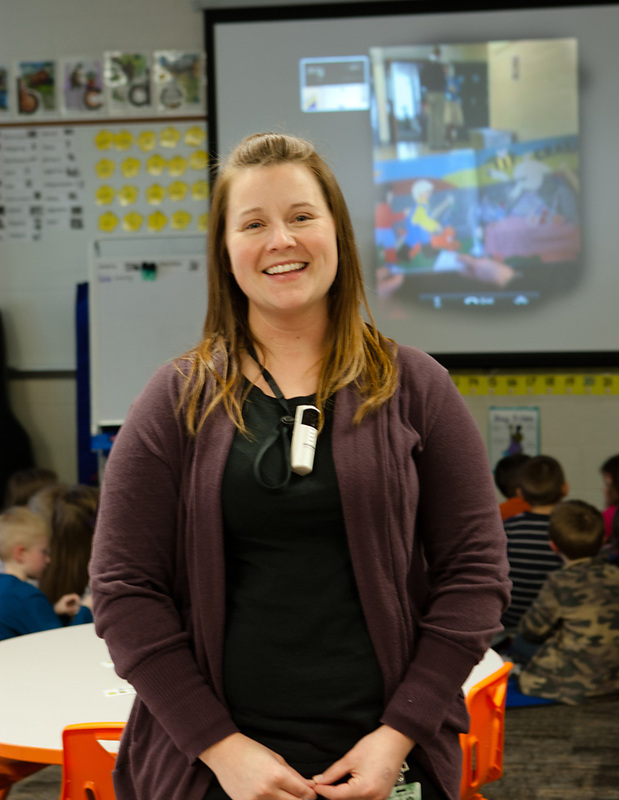 One such teacher is Ms. Keriann Poquette who uses the latest technology to foster growth in reading. Two days a week, students use iPads to read with a reading buddy from Mrs. Ryan’s class at Bursley Elementary School. 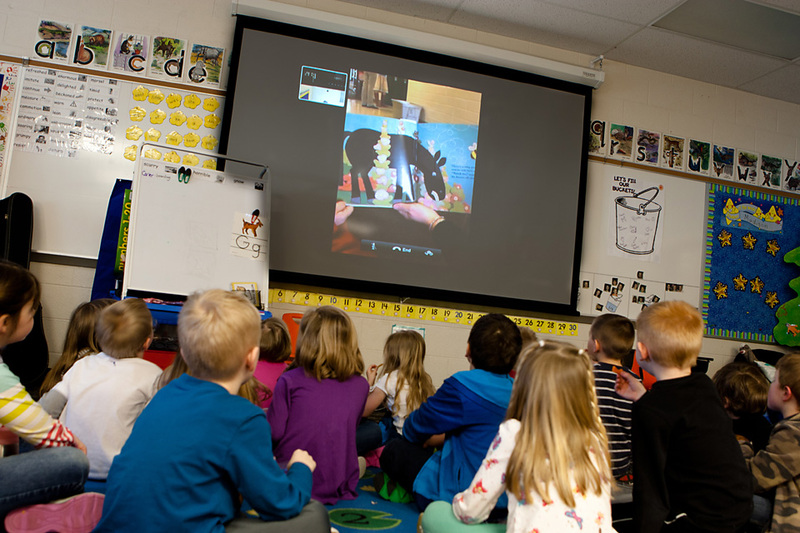 Using Facetime, ECC kids sit and listen to an older student read to them while the iPad sends images from the book. This partnership allows older students on the other side of Jenison to practice reading and gives younger students additionally examples of fluency. In mid-April the 5 year olds at the ECC will begin to read back to their reading buddies, practicing their newly forged skills in a tangible way. Students view pages to their reading buddy’s book via Facetime on the iPad. 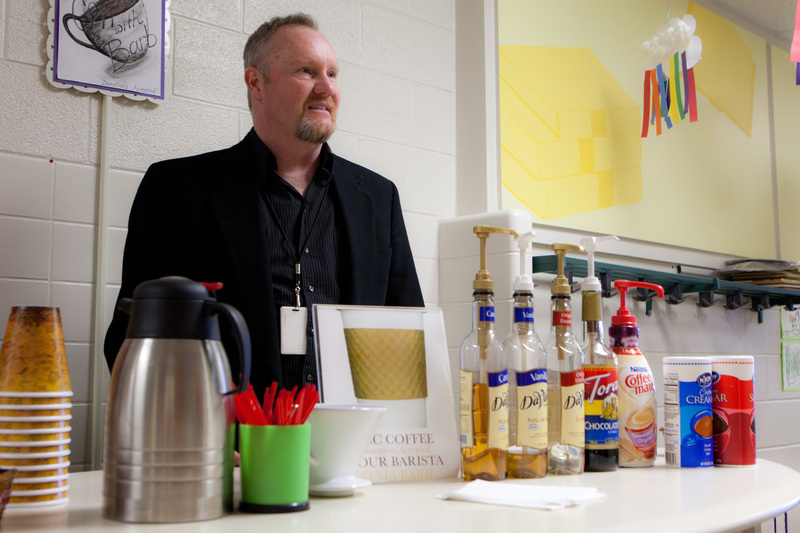 Aside from the gifted staff of teachers, the ECC boasts an amazing army of volunteers who come in every day to run the morning coffee kiosk, work with students, and organize the “Motor Moms” group. 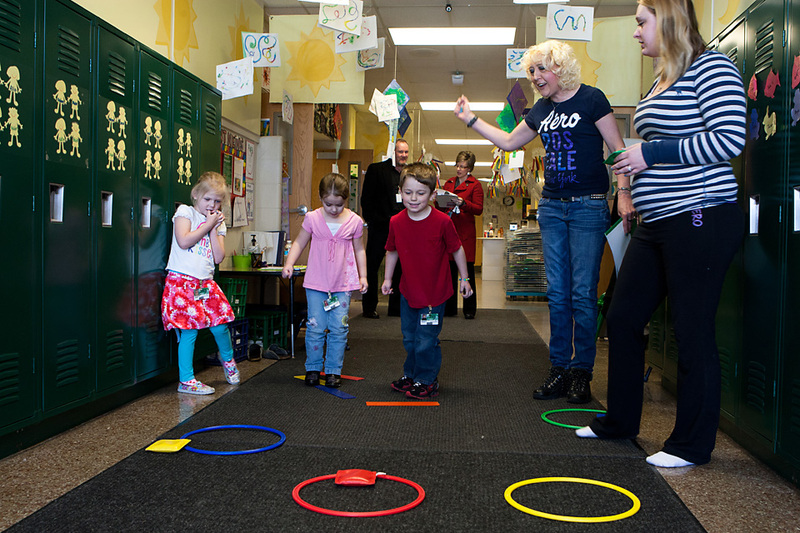 Motor Moms focus their attention on developing fine and gross motor skills by employing techniques used in Brain Gym and Bal-A-Vis-X. Examples of those activities include: obstacle courses, balance beams, crawling, rolling, galloping-to-marching, catching and throwing. Motor Moms work with students each day. 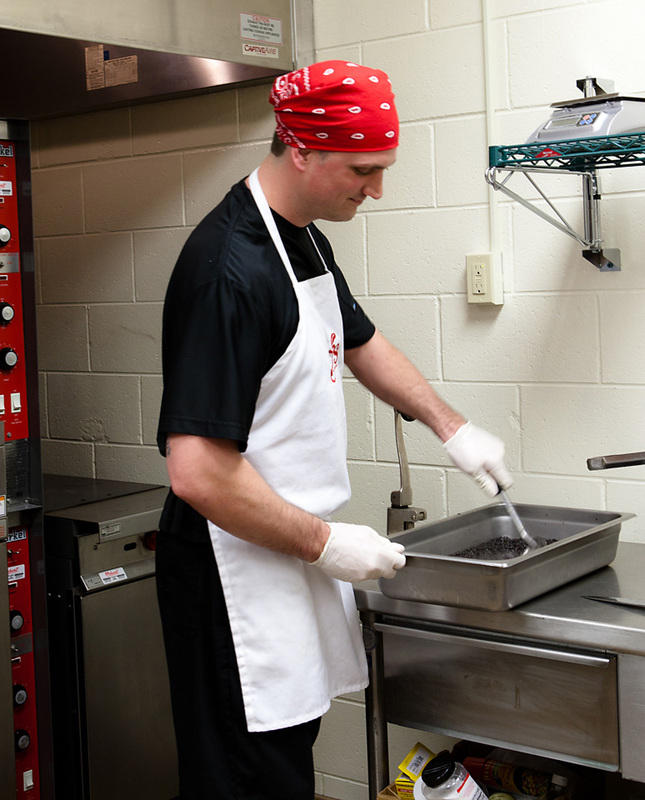 Chef Wade Borysiak preps black beans for the next day’s lunch menu. All that galloping works up an appetite in the kids, and they’re fortunate to have GRCC Culinary Institute graduate and former Head Chef at GR’s One Trick Pony, Wade Borysiak, prepping fresh vegetables and healthy meals each day for the entire facility. Aside from the community garden on the ECC grounds which provides food each spring and summer, Chef Borysiak shops locally at least every-other day for the freshest foods. On the menu that day: whole grain brown rice with mirepoix and slow roasted pork shoulder. Mr. Westervelt is passionate about the connection between healthy eating and healthy, well-fed, attentive kids who are ready to learn. His dream is to expand the kitchen, hire a sous chef, virtually eliminate sugar and processed food from the school, and begin to partner with local farms for a larger variety of garden-fresh options. But more than anything, Mr. Westervelt and his staff are excited about kids. They take good care of each other. They pursue excellence. They focus on what’s important. Wow! Do I wish this was available when I was using day care. What an inviting environment and welcoming staff. I always advise young families to check it out! What a great team we have here at the ECC! Way to go! 🙂 All of you are doing great things in your classrooms! Keriann, you are amazing!! We have been nothing but impressed with the Pre-K program that the ECC offers!!! Almost really sad to have to “graduate” my son to K! We will certainly choose the same experience for the youngest in a couple of years. 🙂 So thankful!